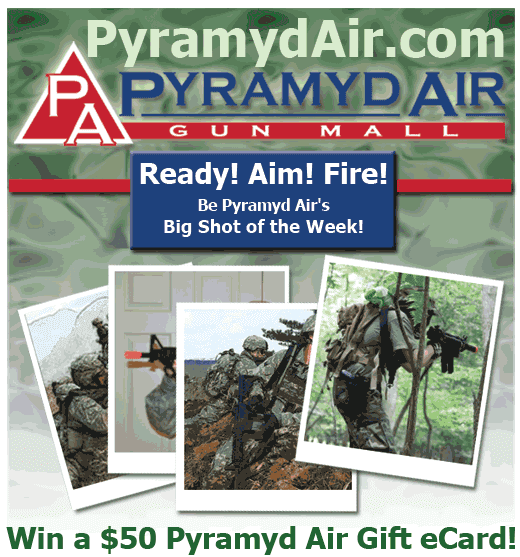 Ah yes, the beauty of Shot Show. You come to a booth thinking you know everything about what they're going to show you and then, BOOM! They hit you with something crazy. That's pretty much how it went down at the ASG booth. ASG, of course, stands for ActionSportsGames, which is a company based out of Denmark and is similar to Cybergun and Umarex in that they hold official trademark licensing for some big name gun manufacturers. 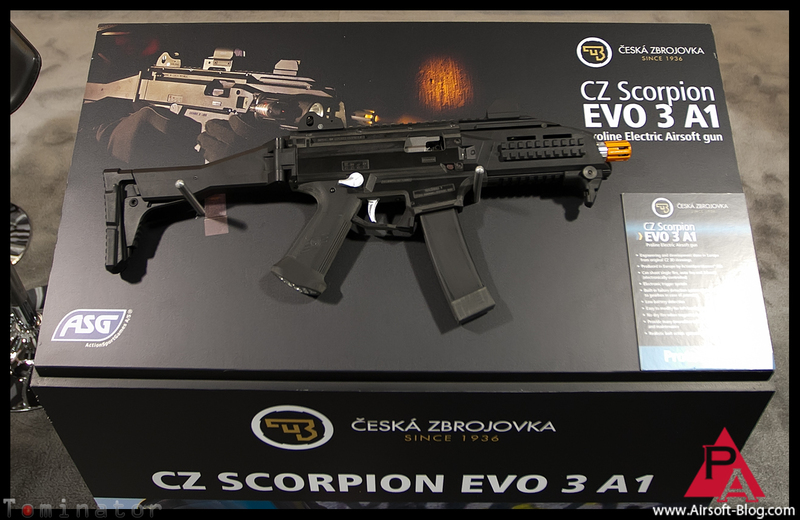 In the case of today's blog, we'll be showcasing the Ceska Zbrojovka (CZ) Scorpion Evo 3 A1 Proline AEG. This thing was nuts. 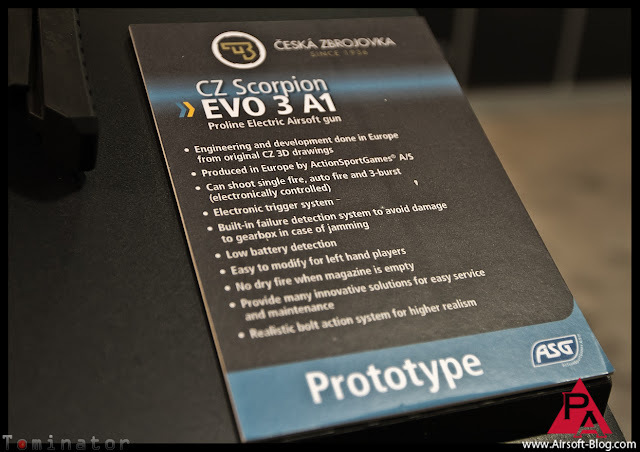 As I mentioned in the title of this blog, it was definitely a prototype made from one of those fancy prototype-making machines. However, I still got a good look at what this unique little AEG is going to be all about. 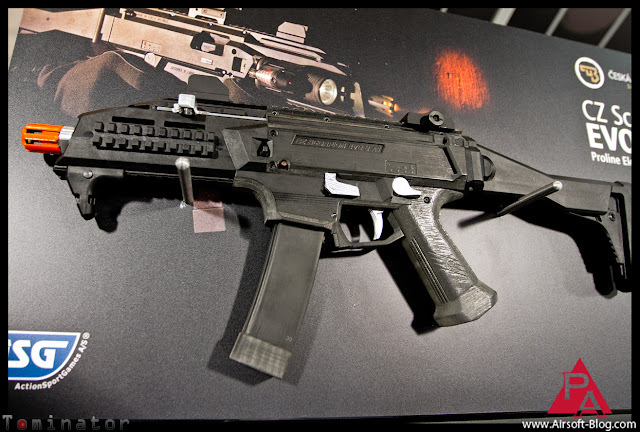 It reminded me of like an MP7 and a PDW mix, or something. I don't know. There's really nothing like it out right now, which I think adds to the mystery, allure and intrigue of it all. You can see in the photos above, that it's going to have an ambidextrous fire selector. Not as visible, but the mag release will be ambidextrous as well. It also comes with that hand-stopper-thingy that you see mounted on the bottom rail underneath the front end. The stock is not only folding, but also retractable. Speaking of rails, it'll have the beloved monolithic upper rail for mounting any number of your favorite optics, lights and or lasers. That silver knob is actually the spring guide, which you will be able to easily pop out for a quick change of the spring, in case you wanted to go from a CQB-safe velocity to an outdoor velocity (or vice versa). Here is the full list of all the features. For those of you that may have trouble reading that, I'll type out a few of the primary bullet points. - Can shoot single fire, full-auto and 3-round burst, thanks to an electronically controlled MOSFET system that comes inside the gun. - Low battery voltage protection, again, thanks to the MOSFET. Very handy if you're going to be running Li-Po battery packs in this. - Apparently, there are some features which can be adapted for left-handed players, which I'm sure people like my brother, who shoots lefty, can appreciate. 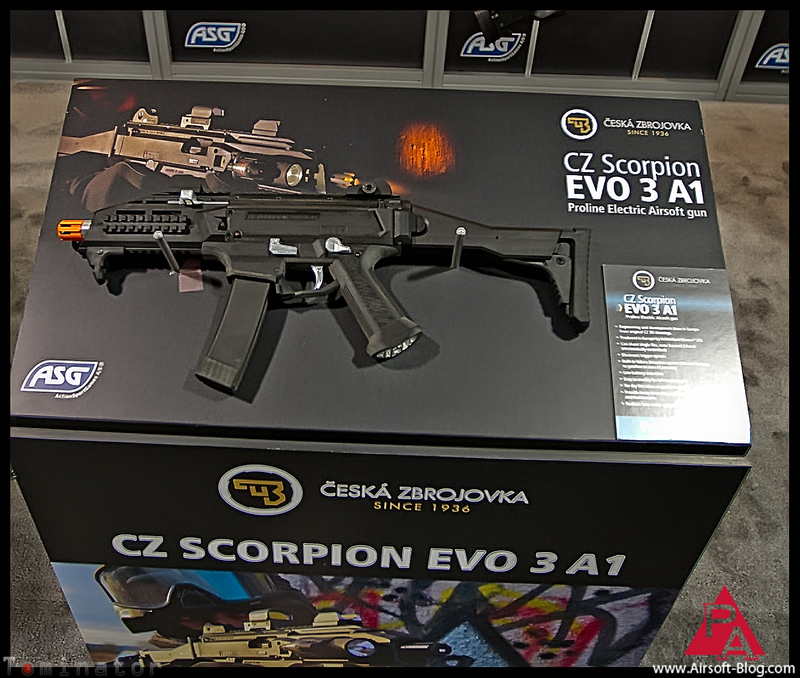 - This is interesting, the gun will stop firing when the magazine is empty. As in, no dry-firing, which certainly adds a nice touch of realism in there which most AEGs do not have, especially built-in to them at the factory. - It says a realistc bolt action system for higher realism, but I don't know that means it will be blowback or not. 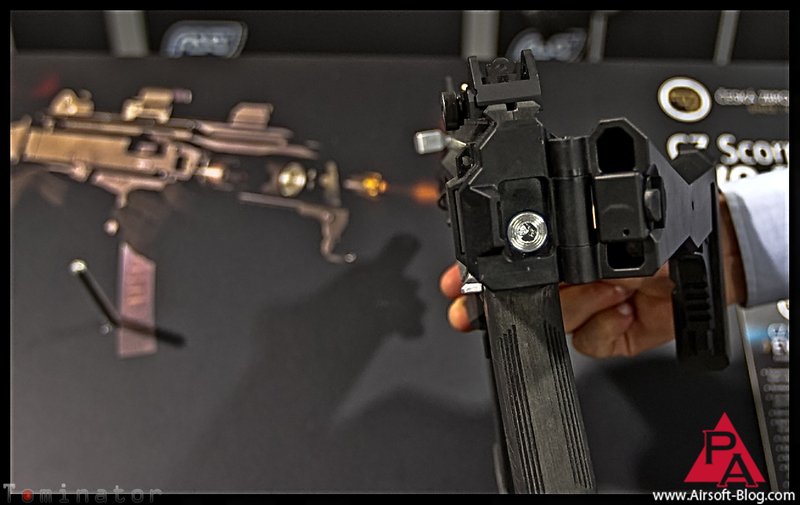 It may just have a bolt that you can pull back like most AEGs, but won't cycle during firing. I want to say that I asked the reps about blowback while I was there and was told no, but I can't recall for certain. Time will tell on this one. They're shooting for a release date at the end of this year, but did not have a retail price point set (at least not one that I can remember). So keep an eye out for that later this year. In the meantime, get your votes in quick! 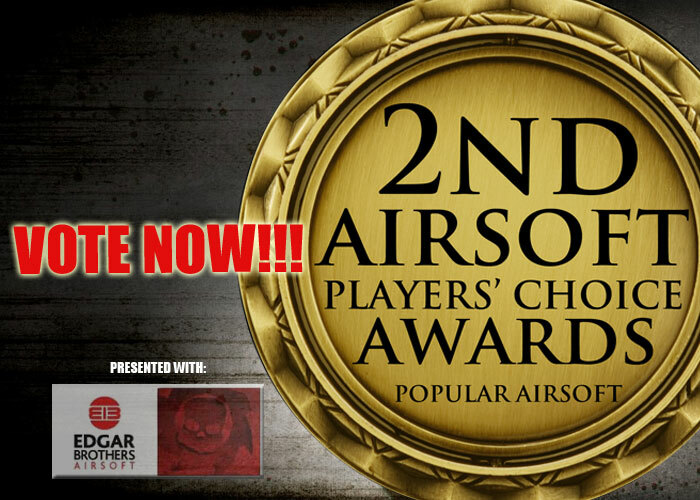 Voting closes for the 2nd Annual Airsoft Players Choice Awards over on PopularAirsoft.com. Check the link below.